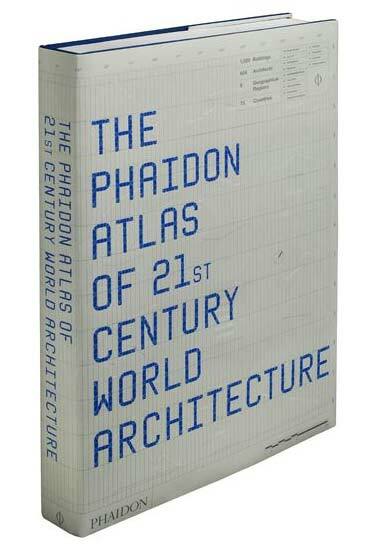 Few architecture books dare to take on the mantle of Atlas, but The Phaidon Atlas of 21st Century Architecture seems to comfortably wear it. The book is a sequel to 2004's The Phaidon Atlas of Contemporary World Architecture --whose general outline and format the current book shares--and by looking at the measly amount of buildings that showed up in magazines between now and then, you would think that the new book would have lots of projects reprinted. Not so: almost all of the 1,037 buildings did not appear in the 2004 book. But when you consider the deluge of projects that have shown up online in that time, it's nothing short of astonishing that the book encapsulates such an encyclopedic spectrum. The project covers 6 world regions, and many of them, like China, seem remarkably well-covered. The book's format is as challenging as it was before. While the internal organization, color coded pages, project numbering, and useful maps all make the book supremely easy to navigate (special props go out to cross referencing other projects in the same book by the same architect, a great way to cross-link different regions or cities), the sheer size of it makes it challenging. The book is 17.75 inches by 12.25 inches: it won't fit on almost any bookshelf. It comes in a carrying case identical to the 2004 version, except this in lime green see-through plastic, further eliminating it as a bookshelf candidate. The book is 824 pages, which translates into about 2.5 inches thick: it's heavy. Most people are only going to be able to read it on their dining table or a special place they've carved out on their desk, which will need to be reclaimed after a brief browse-through. I can't imagine sitting with this one on my sofa. None of this is a criticism. It is simply to say that the format sets up a very specific way of reading the book. You must make space, and time, for it, the way you would a large atlas in the New York Public Library's Map Room. All this we can respect. It does beg the question: is all this necessary? Many of these projects have shown up on Tropolism or get the encyclopedic treatment on Arch Daily / Plataforma Arquitectura. Wouldn't the web be a better home for this sort of thing? Easily cross-linked, not constrained by the limits of page counts or book weight, the weightless world wide internet seems like a better home for this sort of information. But after clearing space in our office (the conference room was taken, we cleared a lot of models and drawings on our side counter) and making special reading time, we are not sure the answer is so clear cut. Or if this is the right question. The web can pick up even more projects, but very-large-format books still outstrip the largest of monitors in terms of being able to see a page all at once. Drawings, the art of which has long suffered in our age of Architecture On The Personal Computer, simply cannot be seen in all their thick, think, and microthin lines on a monitor. In print, they come alive, and a new component of information comes to life in a project as a result. Finally, navigation of a book, by flipping, is still far less disorienting than it is online. You can cross click more efficiently on the web, as well as click-from-map better, but these are all activities designed to eliminate randomness, while allowing you to flow from one impulse to another. You cannot get truly random on a web page without wondering where the heck you are. In a book, you know the number of pages you went forward, and your finger might already be stuck in your former page. In short: it's far easier to serendipitously discover more new projects in remote parts of the world in the book format than on the web. But even then the answer is not so clear. The book hedges its bets. Every project has latitude and longitude, so one can find it on google maps. Like the smallest project in the book, the Too Tall Tea House, weighing in at 67 square feet, and located right here in Chino, Japan. Phaidon has also created a small promotional website that whets one's appetite for the book by implying a web-based book of the same scope. Only 30 projects and a few diagrams are presented in this mini-site, but it is unmistakably a test run for the 2012 version, which will be fully online, accessible for a one-time fee. Or not. All of this is to say that the book is large, and large enough to play with some big book questions. But it's not a puffy book. It's a hard, big, deep look at contemporary architecture, with more projects than one can take in in a sitting. It is a cornucopia of design ideas, forms, attitudes, sensibilities, materials, outlines, strategies, tactics, terms, assemblies, speculations, and structures. It is worth having for every reason. The book can be purchased at Amazon .